Round Stickers is rated 4.3 out of 5 by 13. Rated 5 out of 5 by tjmedia504 from Great features and Great Customer service I'm really impressed with the quality of the stickers and the customer services were awesome. Rated 5 out of 5 by Stacy B from Exactly what we wanted The product was easy to order and is exactly what we wanted. We will definitely order again! Rated 5 out of 5 by Jamie173 from Quality and price are spot on! These turned out great, especially for the price. Very happy with our order. 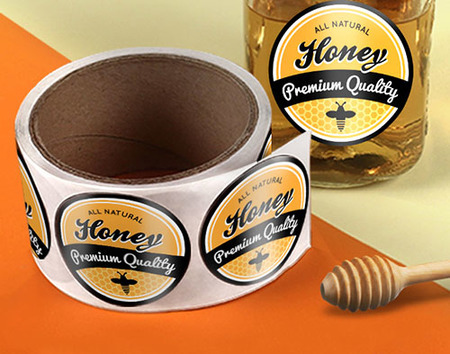 Print stickers customized for you. Our sticker printing is highly customizable, so you can make your own stickers exactly how you need. Choose from a variety of paper stocks like standard sticker paper to weatherproof vinyl and clear BOPP. Pick your shape too. Add your own design and your custom stickers will be ready to print. Whether printing fun stickers for kids in your classrom, photo stickers for your wedding, or bumper stickers for marketing your business, you'll easily be able to create what you need. We also have friendly print experts ready to help with any questions you may have. Our sticker layout templates will help you properly create your design. They show you the exact size your artwork should be to print with a professional look. They can be downloaded through a desktop PC in AI, PSD, PDF, or JPG formats combined into one .zip file.